Over spring break, KO’s archivist Brenda Semmelrock took a busman’s holiday to Bath, England to visit part of our school’s roots at Kingswood School, founded in 1746 in Kingswood and later moved to Bath in 1852 as the school grew in size. Rummaging around musty and cramped archives may not seem like much of a vacation, but for Semmelrock it was “great opportunity to see where it all it happened and see how their history impacted our history and learn some more about Mr. Nicholson,” she said. According to Melancthon Jacobus’s account in Kingswood: Fifty Years 1916-1966, local parents in the Hartford area in 1916 engaged the services of thirty-year-old George R.H. Nicholson, an Englishman, to organize a fine country day school for young men. “A graduate of Kingswood School in Bath, England, he had returned there to teach after taking an honors degree in history at Manchester University and freelancing a little in journalism on the side. At Kingswood as a student he had been Senior Prefect and the captain of cricket; later on the Faculty, he was housemaster and taught history and classics.” Nicholson requested from the namesake school that the Hartford version adopt the name, crest, colors, and mascot, and the Head of School in England granted him permission. Last summer Kingswood School’s Director of Development and Fundraising Graham Papenfus visited KO and invited Semmelrock to tour Bath and the school. For two days this spring, Semmelrock sat in on Form 4 and Form 6 English classes where she was impressed by the students' quality conversation and in-depth analysis of the works they were studying. She explained that in the English school system, senior students are required to take a college entrance exam (A levels). For the English A level, students must thoroughly comprehend three novels which they are tested on critical thinking skills and writing. She shared lunches of unsurprisingly bangers and mash in the Potteresque dining hall, met with the Head of School Simon Morris and spoke with the well-mannered students who wore uniforms (blazers and plaid skirts for girls, blazers and striped ties for boys). Kingswood’s archives are located in the upper level of an older building littered with materials stored on wooden bookshelves, including original letters from John Wesley, the great figure in religious history who founded the school to tame the “course, brutal, and blasphemous colliers” in the area. The archivist Zoe Parson showed pictures of the young scholar-athlete George Nicholson who won several awards while attending the school. One touching tradition that the Kingswood School observes is honoring their alumni men and women veterans. In the school’s chapel, there are several plaques and remembrances of those who served. On Armed Forces Day, students read the names of those who died in action. “You could hear it in his voice how much it meant,” Semmelrock said referring to the headmaster’s account of the special day. Archival photos courtesy of Kingswood School. 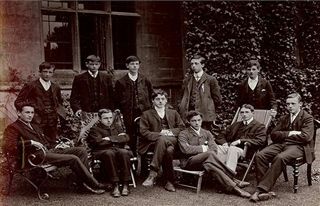 In the formal photo, George Nicholson is in the front row second on the right. 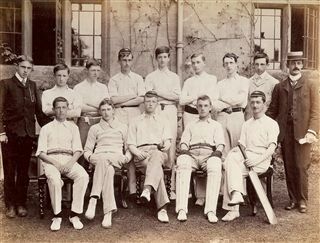 In the cricket photo, George Nicholson is in the front row second on the left.